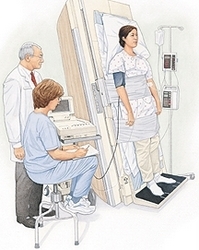 Tilt table testing is a simple test that helps the doctor pinpoint the cause of your fainting. It checks how changes in body position can affect your blood pressure. To do this, you are placed on a table that is tilted upward. The test tries to recreate fainting symptoms while your blood pressure and heart rate are monitored. The test can be done in a hospital or at your doctor’s office. You will be monitored through the entire test. An IV (intravenous) line may be placed in your other arm. The IV line delivers fluids.